Our adroit professional engineers have in store for our clients an excellent product Tomato Ketchup Packing Machine that is widely appreciated in the market for its reliability, performance and sturdiness. These are available in the market at the industry leading prices. 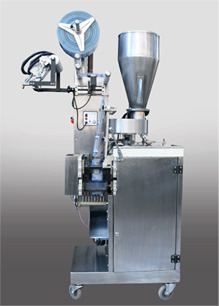 Machine is fitted with: Electric motor sealed gear box, Proximity Photocell panel & control panel, digital temperature controller, volt meter, digital pouch counter, heater failure alarm system, Toggle Switch button type main on-off switches, lubrication pump, Liquid Suction Pump fitted on hopper, SS Covers, Contact parts made of SS-304 etc.